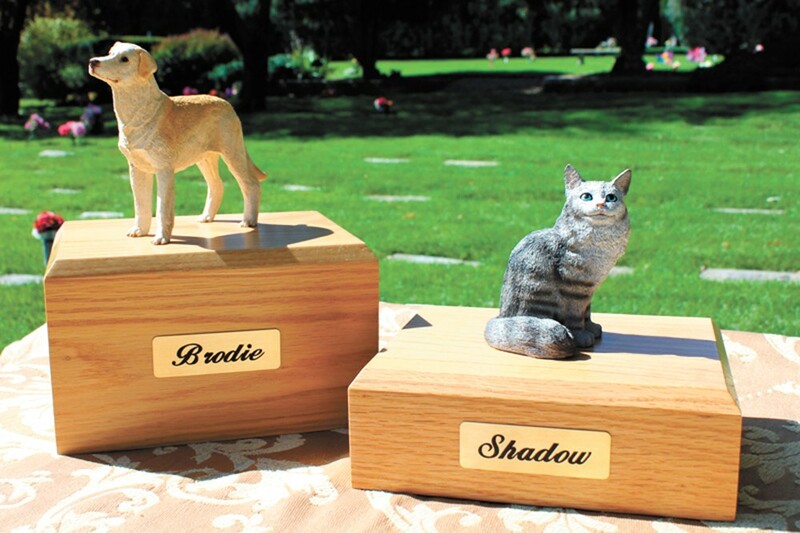 Pet urns memorialize our beloved animal friends. Cinnamon, Mary Kunkel's little white terrier — like a surprising number of adorable dogs these days — has her own Facebook page. "Squirrel Chasing Inc" is listed as her occupation. And on Feb. 28, Cinnamon's page was exuberant. "One year ago today, I had a grapefruit-sized tumor removed from my liver and a recent ultrasound was clear," Cinnamon's page said. "Celebrating!" The celebration didn't last. Two months later, the Kunkels had to make the heart-wrenching decision to euthanize Cinnamon. The loss was devastating. "If I had talked to you a few days after she died, I wouldn't have been able to do it without breaking down," Kunkel says. But now more than ever, numerous resources have cropped up to assist pet owners left reeling from their loss. There are entire hotlines, online support groups, trained veterinarians and therapists dedicated to helping bereaved pet owners who are struggling with grief. At Washington State University, veterinary students get specific training for how to console grieving patients. Charlie Powell, spokesman for the Washington State University College of Veterinary Medicine, says that veterinary students staff a hotline that those mourning a lost pet can call. "The bond between humans and animals has become greater over time," Powell says. At one time, we saw pets as a tool — a horse to pull a cart, a dog to hunt with, a cat to catch mice. Today, they're our best friends. "We've had a few people threaten suicide over the loss of their animal," Powell continues, "It's very common for people to lock themselves in their exam room after euthanasia and grieve with their pets for hours at a time." One big message that the pet-loss hotline assures callers: It's natural to be heartbroken. "There's nothing wrong with grieving," Powell says. "It's perfectly OK for the big burly 300-pound cop whose canine companion has died to bawl his eyes out and miss work." In Spokane, Bob Brandkamp used to have a professional therapy practice focused entirely on helping people through the grief of a loss of a pet. After his license expired, he stopped charging money for it, but still meets with people to help them through the process. "Grief is grief," Brandkamp says. "You go through the same stages if you lose a human that you know." He assures people they needn't feel guilty about their pet's death. "It's nothing that they've done," he says. "They've done everything within their power to give them the most amount of care." For Cinnamon's owner Kunkel, a crucial part of the healing process was helped along by the veterinarian who euthanized the dog. Kunkel didn't bring Cinnamon to a veterinary clinic. She called up Spokane veterinarian Lacey Rasmussen and asked her to come to the Kunkels' house. In her last moments, Kunkel says, "Cinnamon got to be at home and lay in her favorite spot." Veterinary clinics or hospitals can be stressful places for pets, Rasmussen says. So she drives out to the place of a pet owner's choosing, conducting the euthanizations in living rooms, bathrooms, bedrooms and backyards. The pets, she says, "fall asleep like they've fallen asleep a hundred times before." It's a peaceful moment, and a chance for the whole family to say goodbye to their pet. One kid, she remembers, played a song for his dog over his Bluetooth speakers as the dog was falling asleep. Sometimes, Rasmussen will take a piece of soft clay and press pets' paws into it, to create a permanent momento. "We can leave something with them," Rasmussen says. "It's hard when you take the pet away and they're left with the empty spot." Similarly, Family Pet Memorial in Spokane offers ornate pet urns, necklaces and keychains that a cremated pet's ashes can be placed in. Kunkel says that Rasmussen's presence was helpful. But the loss, months later, still lingers. The original print version of this article was headlined "The Dog That Doesn't Bark"